So on Sunday after a much more palatable bus journey of just 1 1/2 hours we arrived in Gaiman. As soon as we hit Gaiman the Welsh references began with Welsh flags flying, Welsh shop names and a Croeso sign at the towns entrance. The town is so green and colourful. Houses have front lawns and gardens full of Camellia´s- white, yellow, pink, red. The town is very pretty. But perhaps a bit of background now would come in handy…. So in 1880´s life was pretty tough for everyone in Britain, but particularly the Welsh. Poverty hit the country hard and the English were banning the Welsh language and traditions left right and centre. So a group of intrepid Welsh men and women boarded the boat Mimosa bound for Patagonia where they hoped to preserve and practice their Welsh language and culture for the future. Why Patagonia you ask? Well it hadn´t been colonised by any white people at this time (so the Welsh culture wouldn´t be diluted by others) and I think there was promise of fertile lands. However the reality was quite different. Arriving at Puerto Madryn they would have been met by arid desert as far as the eye can see. In search of fresh water, they ventured into this desert and found the River Chubut. And eventually settled in Gaiman, where they began to irrigate the land and create it into the very green place it is now. So we arrived on a Sunday, whether you knew the history or not, you would have known there was something Welsh about this town as everything was shut! So we did what we very often had to in Ruthin when caught out with no milk on a sunday…we went to the garage for essential supplies (water and chocolate)! So after getting slightly addicted to the American ´Law and Order´show, which seems to run on about 3 different Argentinean channels (! ), we decided to head out to find somewhere to eat. Fortunately a lovely restaurant called Conei Wini was open and just after ordering an ´mimutes´(traditional dish of breaded meat!) the town had a power cut! Fair play the restaurant still prepared and served our dinner and we sat and ate by candle light. The lights came back on 40 minutes later just in time for the bill! We later found out that Gaiman got off lucky. The power cut affected everyone south of Buenos Aires! And whereas Gaiman got power back after 40 mins as they can feed power from the South as well as the North, Puerto Madryn (the town we had just come from) were still without power the next day…phew left there at the right time! Monday I will rename, for this blog entry at least, ´Wales Day´! We did everything Welsh the town had to offer, starting off with walking the historical route around the town. We walked through the railway tunnel which the Welsh built in 1914 to connect the town to settlements further west without marking the landscape. (We had fun making echo sounds and flashing my head torch in a disco like manner for the 300 meters!) We saw the Camwy intermediate school which was the first ever secondary school in Patagonia (now I think is a library). We went to see Gaiman´s first house built by David D Roberts in 1974- his family are thought to have been the first Welsh settlers in the town. (We had a look in the visitors book to see if anyone had visited recently from near Ruthin…closest we got was Abergele so not bad!). We then called into the Welsh nursery school called Ysgol Feithrin. After some intrepidation Hedd knocked and went in and gave what would become a heavily used opening line- “siarad Cymraeg?” (“do you speak Welsh?”). The nursery nurse did of course and warmly showed us around the nursery. Her and Hedd chatted away about the recent Eisteddfod and what goes on in the school (in Welsh of course- this i know from Hedds debrief after- this was common all day!). The school is for 1 1/2 to 5 year olds and they get caught in bilingually but mainly in Welsh. 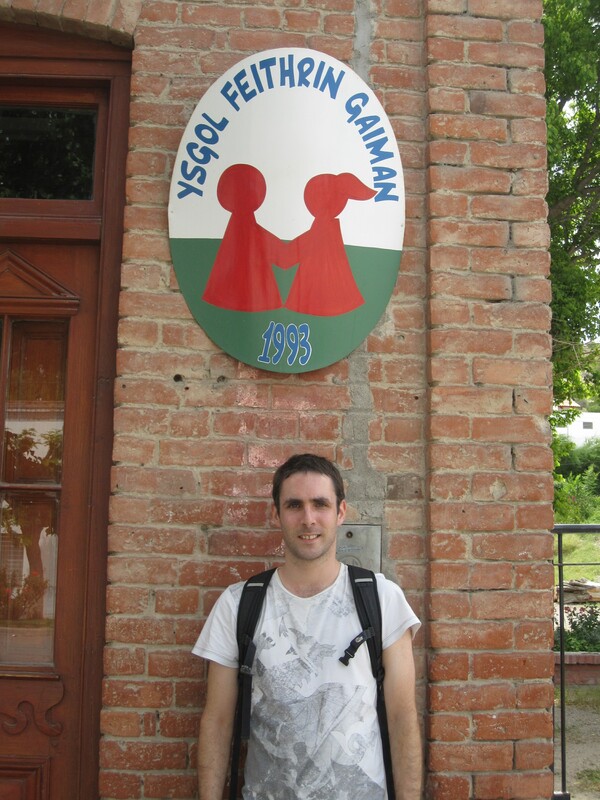 The nearest Welsh primary school after that is in Trelew (30 mins away). It was so bizarre but really quite brilliant walking around the school and seeing all the children’s displays and learning tool in Welsh. So next stop was the Historic Regional Museum, and was well worth the 3 peso entry. There we met Fabio, who with his mother and grandmother, curate and run the museum. It was jam packed with relics, pictures and objects from the Welsh settlers and told their story much better than my brief history synopsis above. Fabio was also learning Welsh and enjoyed practicing it a little with Hedd. Fabio was so excited about the fact of another Welshmen in the town that he called his mum Luned who subsequently invited us to Welsh choir practice that night! No trip to Gaiman would be without a visit to one of the Welsh tea houses. 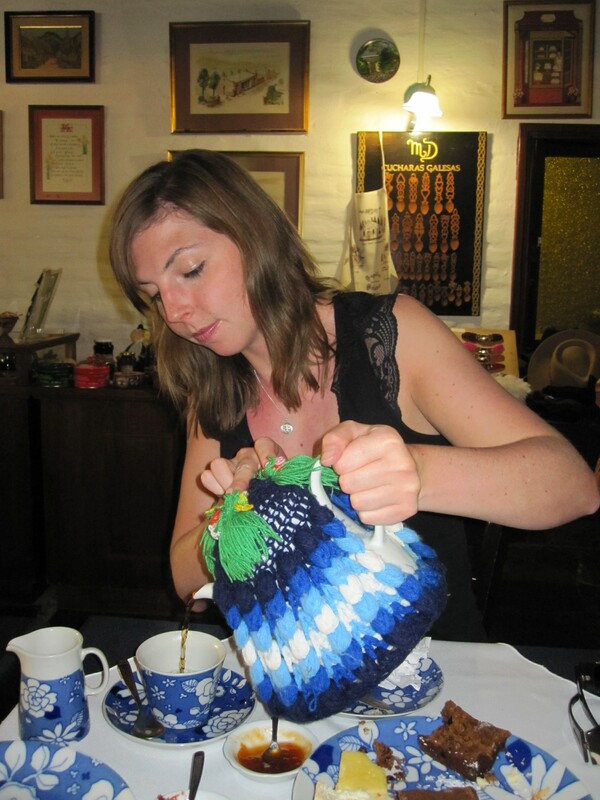 We went to ´Case de Te Ty Gwyn´ (´White House Tea House´) and for 70 peso´s (quite steep on our budget) you had all you can eat cake , stones and cheese sandwiches and copious amounts of tea! Needless to say, after 2 pots of tea and more stones consumed than in Cornwall that day, we ate and drank our 70 peso´s worth and didn´t need any dinner that night! Now Hedd´s Welsh ears were on full alert and we discovered another couple from Wales at the tea house. Hedd went over and said hi, but didn´t leave without a little dig at their accent (they were from South Wales!). Before heading back to our hostel we stopped by the Welsh Chapel in the town called Capilla Bethel y Vieja. A lady there let us in and showed us round both the old Chapel the first Welsh settlers built and the newer one. The newer one Hedd said reminded him so much of his Capel at home in Gellifor so it was a surreal experience for him. The lady of course was learning Welsh and Hedd gathered that the Capel still held services in Welsh every Sunday at 10am, with a Welsh Sunday School run for the children bilingually (Welsh and Spanish) at the same time. Back at the hostel we took a well deserved rest with a glass of vino blanco and began chatting to a new arrival to our hostel called Elen. Very small world moment was had- she is from St Asaph and over in Gaiman for 2 weeks with ´Mentor Patagonia´(´Venture Patagonia´) which is an organisation which encourages the Welsh language in Argentina! Very crazy! She was also going to choir so we all went to Welsh Choir practice, in a small town, in South America, 7000 miles away from Denbighshire! There was a lot of talking in Spanish, and then they sang 1 song in Spanish and 1 song in Welsh. The choir was brilliant. They had no accompaniment, just voice, and when they all sang together you were just hit with a wall of harmonised sound. It was great. Then we had chocolates and everyone left! Most surreal! And that just leaves yesterday. 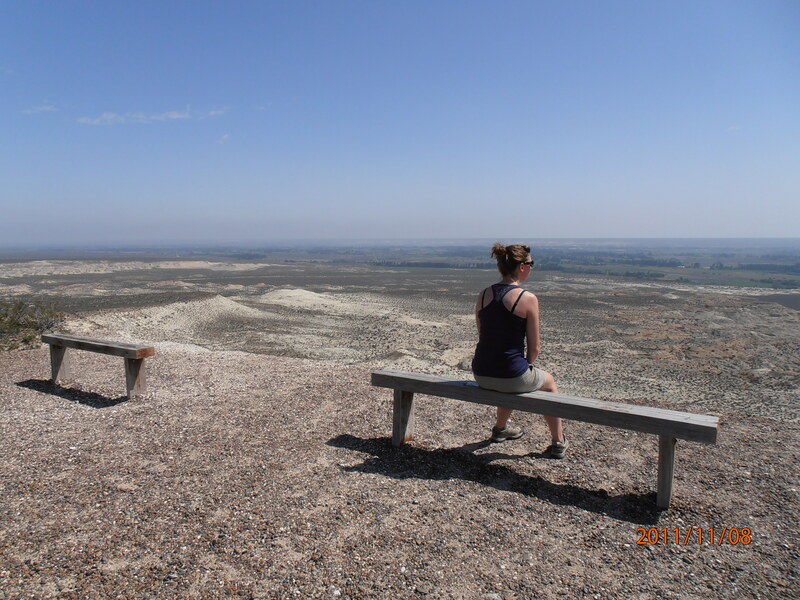 After recovering from our ridiculously long walk in Puerto Madryn, we thought it time for another trek. This time to Parque Paleontologica ´Bryn Gwyn´ (´White Hill´). We got a taxi there and then walked up the hill stopping at the various fossils and skeleton displays along the way which was interesting. But what was the real treat was the view from the top. You saw the River Chubut weaving through the landscape and then a strip of lush green following it perhaps stretching 6k wide either side of the river with trees and farms. But then stretching after that and towards the hill we were sat and beyond is just arid land. Brown, grey land with small desert vegetation. The contrast was quite something and hats off to the Welsh for making such a change to the land all those years ago. We walked the 8k back into town and walked through some of the farms (some with Welsh names such as ´Taid´ meaning ´Grandad´). The irrigation channels you can see from the road which made the cultivation all possible. So that was our 3 days in Gaiman. Off across the Chubut desert tonight on an overnight bus to Trevellin which sits in the shadow of the Andes. Lets hope the bus driver skips the DJ music mixes this time! Well, it may not be a new Wales as those aboard the Mimosa believed they would be creating, you might have to look a bit harder and scratch underneath the surface and look beyond the typical “tourist” tea houses, but the Welsh are still here and we should be proud of that fact. 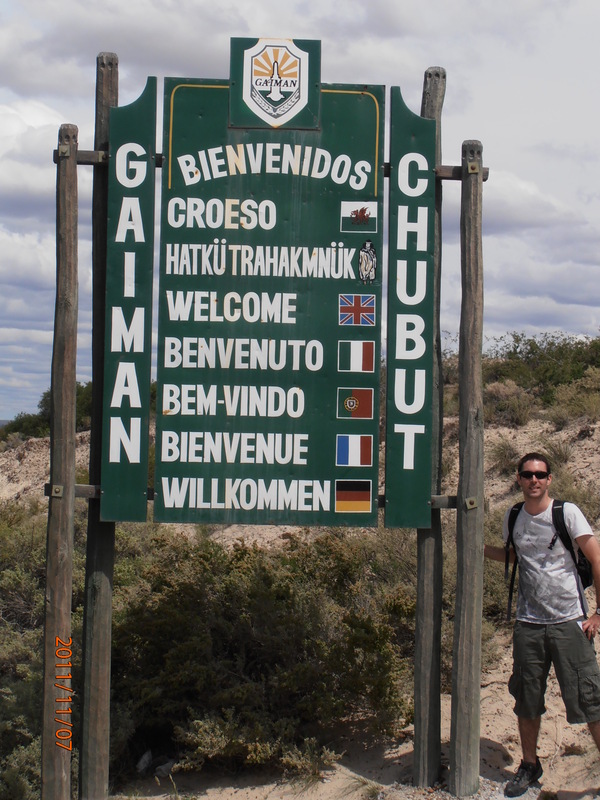 I realise now that although I knew of the connection between Wales and Patagonia, and knew a little of the story, I had no idea about what was achieved here. We should be proud as a nation of those brave soles that made the journey here, of the fact that Welsh is still spoken here and has survived over a 100 years, but also of what was created here. A barren (belive me, barren) landscape was transformed into nothing other than an oasis of green by the river. As the owner of the hostel in Puerto Madryn said, they created farms in the middle of the desert – crazy!! That is some achievement.